Again with the Chicago Soy Dairy Teese Challenge! This time I had some "mozzarella-style" Teese to experiment with. Now, it's been well-documented that the stuff melts beautifully on pizza, so no need to go there - besides, this is a "challenge"which means "try something half-way creative". So. 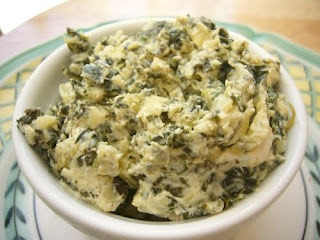 I finally tried "vegan-izing" my old comfort-food favorite - Hot Artichoke Spinach Dip. I realize it relies heavily on vegan dairy "substitutes" but I tend to add more spinach and artichokes, so hopefully the dip isn't as heavy and rich as your typical recipe. Mind you, I haven't tried the original, goopy, mayo-laden dip in over six years, but in my humble opinion, this vegan version knocks the original right out of the tail-gate party! Although spinach is traditional, I've also tried this with very finely chopped and cooked kale or chard, and the results were good. Different; the kale isn't quite as soft or mild, but still tasty. The dip also makes a wonderful pasta sauce, just in case you have leftovers. Lightly grease a small baking dish. Blend cashews in food processor with just enough water to make a thick, smooth "cashew cream". Set aside. In a small saucepan over medium heat, melt 1/4 cup vegan sour cream and 'Teese' until runny. In a medium bowl, mix together "cashew cream", the rest of the sour cream, the sour cream-Teese mixture, garlic, basil, Tabasco, water chestnuts, lemon juice, salt and pepper. Gently stir in artichoke hearts and spinach. Transfer the mixture to the prepared baking dish. Top with a bit more 'Teese' if you want. Put in oven about 10 - 15 min, just until Teese bubbles and melts on top or dip is starting to brown. Serve with crackers, veggies, or put in a hollowed-out bread-bowl. Yum! Your website is amazing!!! I went through your whole blog picking out so many recipes that I want to make. I even read about your boston terriers passing several years ago. :-( Sad. ~ I live on the backside of Kent in Covington, WA. So is vegfest every March in Seattle? I want to go this year. Yet another reason I MUST mail-order myself some Teese. This dip looks absolutely mouth-watering, tofu mom! i'm going to try this out for my birthday weekend this weekend!